I moved to San Francisco five days ago. When my flight broke through the fog and touched down, I made my way to Mission Street with a roller suitcase and manbag. The rest of my possessions – six boxes of books – are being shipped. I’ve come here to start over knowing full well there’s no such thing as starting over. At night, I sleep on the floor of my friend’s Isaac studio apartment and dream my way through scenes of the book I’m writing. Dreaming is how most of my writing starts. Obsessed over whatever paragraph I was working on the previous day, I dream about the paragraph on a loop, my ghost self locked in the paragraph’s room. I wake up at 6:12 am because I have to pee. I lay back down to sleep and my head lands on my macbook which I keep beside my pillow. So, I start to write. I’m only five pages into a new draft. I write in false-starts, writing and erasing the same paragraph until words start to jive, until the sentences say that they don’t want to be erased. They almost always want to be erased. So, I write a page or two a day. 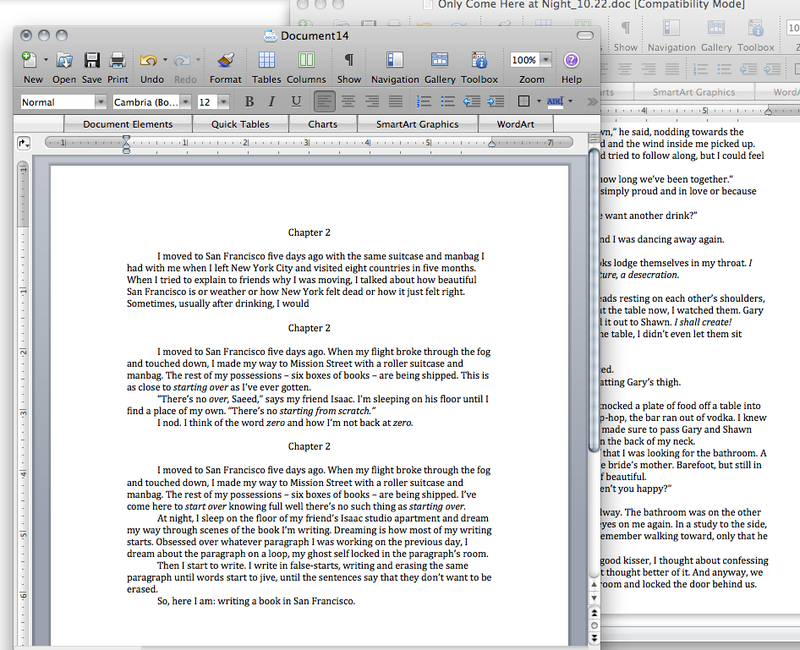 The following day, I re-write most of those pages and maybe walk away with three pages. It’s a weird dance.